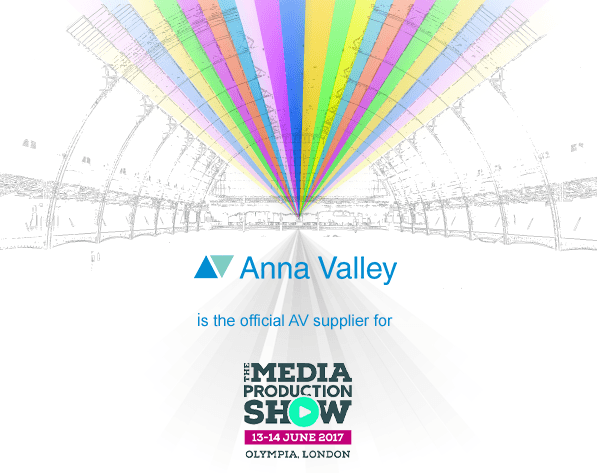 Anna Valley is the official AV supplier to the Media Production Show 2017 and will supply audio and video technology and support across the seminar theatres and to a host of exhibitors on the show floor. Each of the five seminar theatres will be equipped with 75” LG4K screens while audio kits will include Shure radio mics and top-of-the-range D&B audiotechnic and L acoustics sound systems. Our recently acquired Barco E2 system will be used for presentation control in the Keynote Theatre. We’re also providing a range of solutions for exhibitors with everything from small touch-screens to large-format, 4K screens being supplied for on-stand displays. Shooting Partners Director, Shaun Wilton, will chair a session in the Keynote Theatre on Wednesday, June 14 at 12:30. The panel discussion, titled “VR : A new generation” will feature speakers from VR City, Blend Media, M7Virtual and Digital Jam Ltd and will cover points like who should be considering VR production, what the investment in 360 video content is and the process involved in creating this content, from start to finish. Canon has invited the Shooting Partners team onto stand 302 at MPS2017. The SP team will be available to meet with show visitors on the Canon stand and will also present and host the following discussions on the latest acquisition tech and trends. Aimed at producers new to this format, this session will explore the different VT technology available, who’s using it to what effect and how to create communal VR experiences. Canon ambassador and visual storyteller, Simeon Quarrie gives an insight into how he works and the steps he’s taken to get there. When should you rent and when should you buy? He’ll get technical with his thoughts on auto focus on professional productions and he’s on hand to help you understand when to go CLOG2 and CLOG3! Above all, it’s your opportunity to ask questions related to filmmaking, tech and business. The Canon EOS C200 has been available for less than a month and The Media Production Show will be its first UK showcase. This session will take audiences through the selling points of Canon’s new 4K acquisition offering. Aimed at producers new to this format, this session will explore the different VR technology available, who’s using it to what effect and ways to create communal VR experiences.